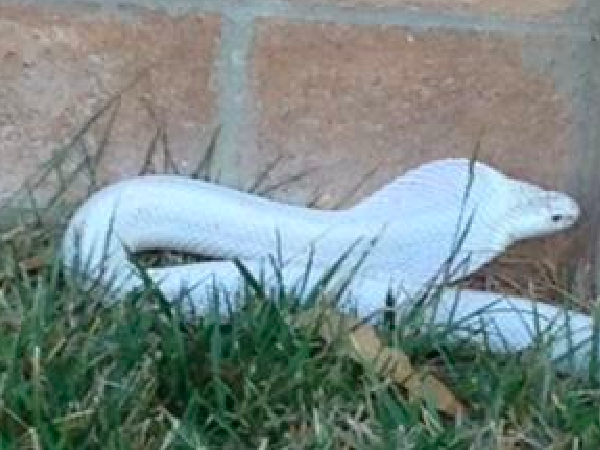 A four-day search for a venomous monocled albino cobra that was presumed to have escaped from a Thousand Oaks home ended with the snake’s capture around 3:15 pm on Thursday. The slithering snake was reportedly discovered along a fence not very far off from the 1300 block of Rancho Lane where it was initially spotted on Monday after it bit a dog, according to the Los Angeles Times. The dog, “Teko,” is expected to make a full recovery. For the record, NO ONE has read my Miranda rights to me. Apparently, snakes aren’t considered citizens. Somebody better tell #Hannity. The snake’s owner has not yet come forward, notes the Times. The snake was reportedly spotted around 2 pm by a mother who was on her way to pick her daughter up from school, reports NBC Los Angeles. Ventura County fire crews responded to the mother’s report and found it shortly after 3 pm. It has not been determined what authorities intend to do with the albino cobra. I’m being treated pretty well so far in lockdown at #AnimalControl. Say a prayer, though–some pretty rough customers caged up in here!